Many of us had piggy banks in our youth. Maybe it wasn't a literal piggy, but it functioned the same. It was that magical money repository where you were told to "save for a rainy day" (because we all spend more money on rainy days). You were told that putting a little bit of money in that bank every day would eventually lead you to financial bliss. You would open it up one day, and you'd be swimming in cash. I'm not saying your parents were lying to you. They were just trying to encourage this habit we call "saving." Saving is good. I do it. Everyone should. But don't get unrealistic expectations about setting your money in a jar. Jars of money don't multiply or spawn money trees. They just sit there. And so do savings accounts with 0.01% interest rates. And the way the American economy works these days, every penny that sits in a jar is worth less with each passing day. Your money is literally decaying. I like saving money, but for a purpose. You should have a goal in mind. You should have a plan for how you will use that chunk of money to, well, get more money. I'm not a greedy money-monger, but I am interested in money. It's important. If you disagree, you're either lying or you have filthy rich parents that float you. 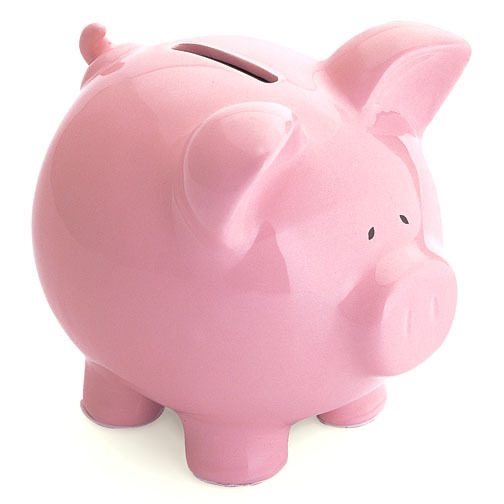 I like piggy banks as long as there is a time and place to whip that money out and do something with it. Don't be lazy and think that setting your money aside will automatically make your financial future a cash-infested utopia. Invest it in something that will return dividends. If money isn't moving, it's dying. I write this at the risk of sounding like I'm encouraging a spending frenzy. I'm not. You MUST save money. My wife and I have always had an "emergency fund" of money set aside for unexpected circumstances. This money is not an investment--it's a buffer between us and financial catastrophe. I expect this money will die in the bank. For the rest of our money, I intend to put it into something that will give returns--whether financial or otherwise.